This is a follow-up to my previous post about the deliberate destruction by the oil company constructing the North Dakota Access Pipeline, of the ancient burials in the area, which were to form part of the Standing Rock Sioux people’s case against the pipeline’s construction. Jan Hasselman, the lawyer representing the tribe, had arranged for archaeologists to survey the site, and they duly deposited their evidence to the court hearing their complaint. The very next day, the company moved the bulldozers in to destroy the site. It’s appalling and outrageous when anyone’s burials are disturbed. It is even more so in this case, when it is the gratuitous action of a powerful, multibillion dollar company against an impoverished community, which has suffered centuries of brutality and injustice. Native American archaeology is rare, and there have been numerous attempts in the past to destroy the Native people’s culture, if not the indigenous people’s themselves. This is yet another of them. Many people are interested in America and Canada’s First Nations and their past. A little while ago I found an excellent book on the archaeology of the American First Nations. 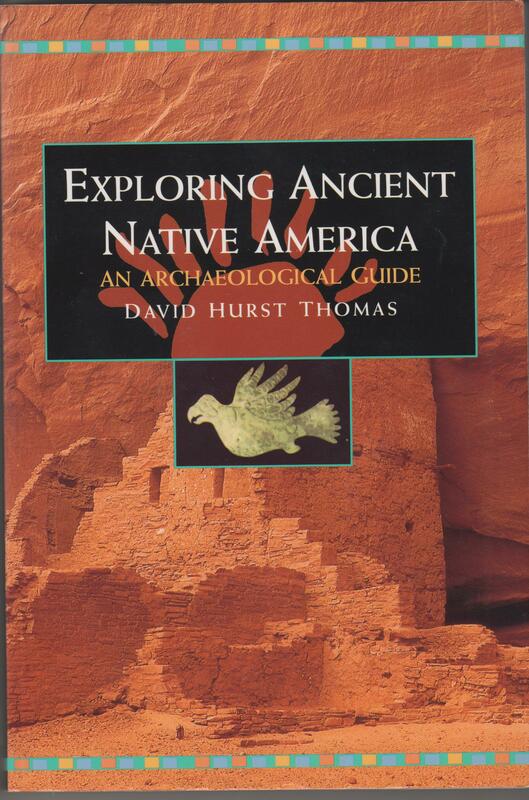 This is Exploring Ancient Native America: An Archaeological Guide, by David Hurst Thomas (New York: Routledge 1994). Colliding Worlds: Old and New? It’s profusely illustrated, with some truly awesome and beautiful photos and drawings of the impressive monuments constructed by Native Americans, from the Pueblo villages and towns of the southwest, to the mounds made in the form of animals, like the Serpent Mound, of the Mississippi cultures, as well as smaller artifacts like pottery, tools, arrow- and spearheads and carvings. There is are also passages giving the Native American perspective on the monuments and their significance to them. The book also includes a list of recommended museums on Native American archaeology, many of which are naturally run by the indigenous peoples themselves. It also gives advice on appropriate behaviour when visiting Native American communities. The two museums mentioned by the book for Native American archaeology in North Dakota are the Four Bears Museum at New Town, North Dakota, and the Knife River Indian Villages National Historic Site at Stanton, North Dakota. The Four Bears Museum is an Indian-operated institution, and is dedicated to the archaeology of the Three Affiliated Tribes, the Mandan, Hidatsa and Arikara. The book gives the tribe’s headquarters as south east of Minot on SR 23. It’s local three miles north on CR 37. It also has a visitor centre. 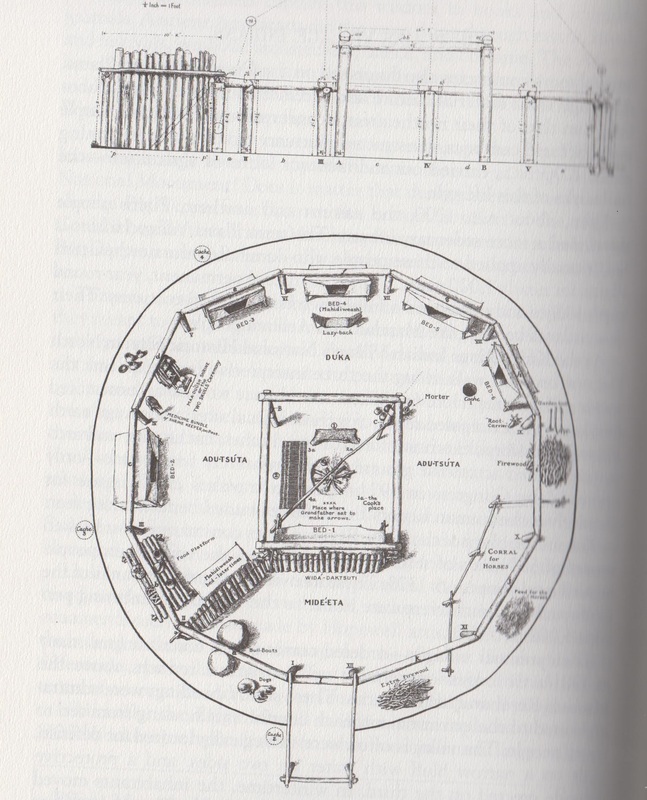 The book also has this illustration by Gilbert Wilson of the structure of a Mandan earth lodge. This was the particular lodge of Small-ankle, the father of Buffalo-bird-woman, as described by her. The tribe, whose land is being desecrated by the oil company, is the Standing Rock Sioux people. I don’t think they have a museum, which is why the oil company was able to destroy their archaeological heritage. This makes it all the more important that their cultural remains should be preserved quickly. Indian America: A Traveler’s Companion, by Eagle/Walking Turtle (Santa Fe: John Muir Publication 1995) gives the location of the Standing Rock Sioux reservation at Port Yates, North Dakota 58538. It’s in south-central North Dakota and north-central South Dakota, directly south of Bismarck, North Dakota. The tribes placed on this site in 1908 were the Blackfoot (Sihasapa), Hunkpapa and the Lower and Upper Yanktonai Sioux. The tribe holds its annual pow-wow at Little Eagle, South Dakota. This is another interesting video from The Young Turks’ reporter, Jordan Cheriton. In it, he covers a ceremony by the Rosebud Sioux tribe to honour one of their members, Happy American Horse, for his courage in protesting against the North Dakota Pipeline. This is an oil pipeline being tunnelled through the tribe’s territory, which threatens to pollute their water. As the chief in this simple ceremony points out, water is life, and ecology is important to Native American spirituality and identity. Mr American Horse is awarded an eagle feather, the traditional Plains Indian mark of a courageous act. The guy chained himself to one of the digging machines and stayed there to stop them digging, despite his understandable fear and calls from the workers to start it up, and so kill or injure him. Also present at the ceremony is Black American activist, who leads a chant of the words of one of the great Black American civil rights leaders, and a Black Jamaican. This last man, who describes himself as from the land of Marcus Garvey and Bob Marley, also unveils the Jamaican flag to honour Mr Horse’s courage. Marcus Garvey was one of the pioneers of Black emancipation in the late 19th and early 20th century. It was his belief that there would be a Black messiah from Ethiopia that laid the foundations for Rastafarianism. There are also a couple of White Green activists present, as well as Cheriton, who also add his words of encouragement. I’m reblogging this as, although it’s very much an American protest, it’s part of the same struggle that’s going on over here as well in the campaigns against fracking. Quite often, those companies despoiling the awesome beauty of the American countryside are the same people wrecking the awesome beauty of the British environment, and poisoning our water like they’re poisoning those of the poor, the marginalised, and ordinary Americans over the other side of the Atlantic. These are the same companies supported by the Republicans, Shrillary Clinton and the Tories over here. The coverage of the ceremony is another example of the way YouTube and the internet is transforming politics. Yeah, there’s a lot of rubbish and craziness on there, but it also allows activists to see, talk to and be informed about activism by ordinary people right across the planet. It’s why YouTube has now got frightened of this power, and is issuing stupid restrictive guidelines in case it puts off advertisers. It’s why the Tories want to censor the Net, all under the guise of protecting the vulnerable from Paedophiles, of course. But at it’s best, the technology does help to fulfil Reith’s dream of bring nations and people’s together. ‘Nation shall speak peace unto nation’ is the quote from the Bible that’s written above the BBC’s entrance. This is also part of it.